Mitch McLain attempts to get a shot off last Saturday against Alaska. 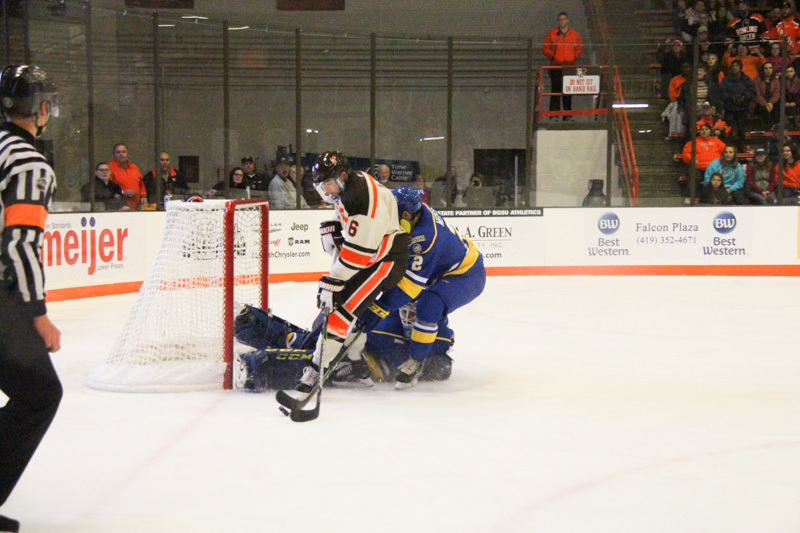 McLain netted the shootout winner to earn the Falcons an extra WCHA point (Photo by Jessi Renner/BGSUHockey.com). Max Johnson scored a rebound goal at 2:56 to kick-off scoring and J.T. Henke added a rebound goal for the Lakers at 54 seconds of the second period. Brandon Kruse gave the Falcons the lead at 6:08 of the second period but a puck that was accidentally redirected into the net by Carson Musser in the third period pushed the game to a 2-2 tie. Neither team could find the net in the overtime periods and the game went to a shootout. It took three rounds before someone found the net, and it was Mitch McLain who scored the shootout winner to give the Falcons the extra point in the WCHA standings. Eric Dop ended his night with 20 official saves on the night while Nick Kossof had 34 stops. For the third time this season the Falcons have taken a lead into the third period but only managed a tie. Bowling Green is being outshot in the third period by 16 aggregate shots and is also being outscored in the third period by four goals overall. The Falcons are 3-0-3 this season when taking a lead into the third period. Of the Falcons 23 goals scored this season 18 have been scored by freshmen and sophomores while just eight have been scored by juniors or seniors. Friday night was a “loss” for the Falcons’ special teams units. Their power play was 0-for-3 including a five-on-three advantage that was fruitless, and the power play units finished with 10 shots on net. Overall Bowling Green is 10-of-50 (20%) on the power play this season but is just 6-of-34 (18%) in WCHA play. Lake Superior was 1-of-5 on the night with eight shots. The Falcons’ penalty kill is succeeding at a 47-of-56 (84%) clip overall and 33-of-40 (83%) in WCHA games. WCHA Linesmen Andy Hempel (94) got his skates caught up in play midway through the second period and had trouble getting up. He skated off the ice at the next whistle and did not return the game. T.J. Likens (63) finished the rest of the game as the game’s lone linesmen and made a key call late in the second period when he whistled the Lakers for a high-stick, negating a would-be Lake Superior goal. Ferris State earned their first conference win of the season with a 3-1 decision over Alaska, #20 Northern Michigan struggled in their first game of the season as a ranked team with a 4-1 loss to UP rival Michigan Tech, #10 Minnesota State handled in-state rival Bemidji State in a 5-2 win, and Alabama-Huntsville browbeat Alaska-Anchorage with a 5-1 home win. The Falcons and Lakers will finish their weekend series Saturday at 7:07 PM. 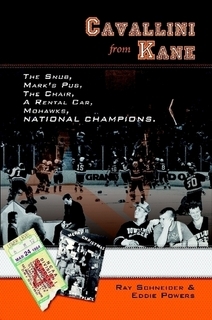 Next weekend they’ll be making the long trip to Mankato, Minnesota to face the WCHAs 1st-place team: Minnesota State.